Now you can record the sounds and any speech in Second Life, simply and easily, with SoundLeech, a great sound grabbing Freeware app by Mike Looijmans. Update - Works on Windows XP and Vista but does not seem to work on Windows 7. The Sound Leech captures sound from other programs. Contrary to most solutions which involve emulation drivers, Sound Leech runs as a simple application and captures sound from the applications themselves, rather than "what you hear". Even better, it makes a wave file for every gadget, so if you are recording Second Life and your computer goes 'ding' in another window which would ruin your recording, the ding gets put into it's own wave file! With Sound Leech, you can finally obtain a digital copy of streaming audio. When you start up Sound Leech, it displays an icon in the task bar near the clock. Right-click this icon to access the menu which contains the settings and activation. It will remember every setting for the next time you start it. 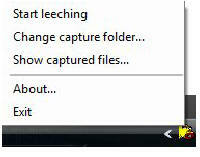 To start recording, choose a capture folder first. The default is the "My Documents" folder. Then select "Start capture" from the menu. Next, start the program(s) you wish to capture audio from. When it detects a program that is playing audio, you will see a balloon pop up for about 10 seconds which shows the name of the program. Recordings are stored in the capture folder. For each program it detects, it creates a sub-folder here and writes the intercepted audio into separate WAV files. Before playing back such a recording, remember to de-activate Sound Leech, or it will capture another copy from the playback program.